Dirty grout is often the one thing standing between dingy-looking tile and tile that pops. Knowing how to clean grout is essential for floors, walls, and counters that look sparkly clean. While tile is resistant to dirt and stains, grout is porous, meaning it will absorb any grease, grime, or spills it comes into contact with. Learning how to clean grout will not only extend the life of your tile, but it will keep it looking its best. Here’s how to clean grout in any spot in your home. As with any cleaning project, it’s always a good idea to begin with the mildest cleaning solution. Highly caustic or acidic cleaners, like bleach or vinegar, will corrode and slowly destroy grout, as well as tile finishes. You might be surprised how clean you can get your grout with just some hot water and a brush. With that said, if grout is deeply stained, there are other effective cleaning solutions that you’re likely to already have on hand. 1. Prep the area: Begin by spraying the grout with hot water and scrubbing with a stiff bristle brush (an old toothbrush is perfect for this) to remove any dirt or grime on the surface. Follow the grout line as you spray and scrub in a circular motion. If you have one on hand, you can also use a steam cleaner, which is very efficient at cleaning grout. 2. Mix the cleaning solution: Make a paste of two parts baking soda to one part hydrogen peroxide. If you’re working in an area where grout is exposed to grease (i.e. the kitchen), add in a few drops of dish soap. 3. Apply the solution: Spoon the mixture onto the grout and allow it to sit for around 10 to 15 minutes. Giving the cleaner time to work into the pores will result in cleaner and brighter-looking grout. 4. Start scrubbing: Using a brush, scrub the grout lines to lift up any dirt trapped in the pores. 5. Rinse the tile: After scrubbing, mix a few drops of dish detergent in with some hot water and use a sponge or cloth to rinse the tile and wipe up the remaining grout cleaner. Keep it clean: The best way to preserve all of your hard work is by applying a grout sealer. Sealers fill the pores of the grout, keeping dirt and grime out. Before applying the sealer, wait at least 24 hours to make sure the grout is completely dry. How often your grout needs to be resealed will depend both on the sealer you choose and how much traffic the area gets. Tip: Running a squeegee over the tile after every shower can help prevent mold and soap-scum buildup, making shower tile look fresh and clean. 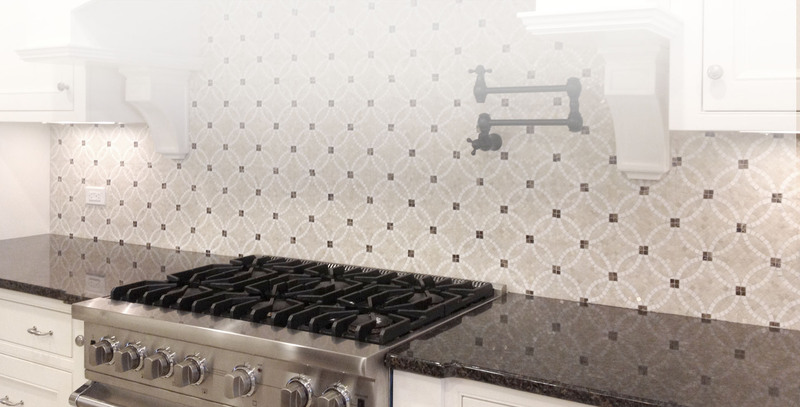 Interested in adding tile to your home? Come check out our line of products! Interested in reading more articles?